Now that the internet has ended the correlation between barrels of ink and reach of audience, companies are more inclined to “quarrel” with the media. In the old days, if a company took issue with a critical article, it might write a letter to editor, contact the publication’s ombudsman or cajole a correction out of the journalist’s boss. These actions seem downright quaint in today’s world in which companies can use owned media to blast away and deliver their point of view directly to the target audience. Between blogs and social platforms, all organizations can gain the means to reach an audience as large or even larger than a media property. I also think what emanates from the White House these days adds digital fuel to the fire. Even if you find the behavior fit for “The Gong Show,” there’s no getting around that President Trump’s combative approach to the media further emboldens others. Walmart, Tesla, the Brookings Institution and last week Kaspersky Lab are just a few of the organizations that have taken the fight directly to their media nemesis and punched back. Let’s take a deeper look at Kaspersky Lab’s recent tangle with Bloomberg Businessweek brought to my attention by friend and colleague Frank Strong. The Bloomberg Business story threatened Kaspersky’s business, making a case that the company is in bed with Russians. Obviously, it’s an inflammatory accusation given that every day seems to bring a new tidbit that Team Trump enjoyed a helping hand from the Kremlin. Kaspersky’s move was straight out of the Crisis 101 handbook: don’t allow your adversary — even if that adversary turns out to be a media empire — to own the narrative. And the sooner you fling your point of view into the digital sphere, the more likely your perspective propagates right alongside the media story. Bloomberg Businessweek published the Kaspersky story on July 11. Kaspersky managed to go live with a document refuting the charges on the same day. Such nimbleness pays off in how Kaspersky surfaces during organic searches. Plugging [Kaspersky Businessweek] into Google brings back a SERP (search engine results page) showcasing both the Businessweek piece (point) and the Kaspersky clarification (counterpoint) high on Page 1. It’s the perfect outcome from Kaspersky’s perspective. Drilling down to the next level, I asked two questions. Is the document persuasive? Does the document leave the reader with the impression that Kaspersky is right and Bloomberg Businessweek is wrong? Unfortunately, it’s downhill from there with the document depending on superlatives, adjectives and adverbs to carry the narrative instead of dot-connecting logic. Even though I wasn’t in the room, you can tell emotions ruled the copywriting exercise. Rather than make a case in which the reader concludes that Bloomberg Businessweek reshaped facts to fit a flawed hypothesis, Kaspersky chooses to club us over the head with its message, a tactic which only works in Flintstone cartoons. There’s no need to hide the source of the heartburn, Bloomberg Businessweek, or hide the specific allegation involving the Russian government. Everything is out in the open where it belongs. Are there times when it’s NOT important to be clear? Back to the big picture, it’s healthy for companies and individuals to challenge the media. Such discourse produces better journalism. 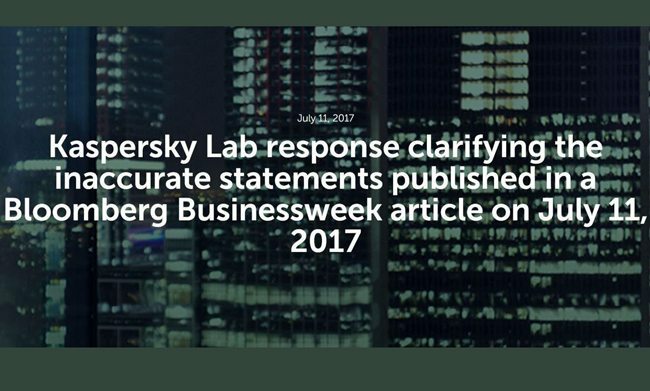 Given the allegations in the Bloomberg Businessweek story, Kaspersky took the right action in communicating its side of the story. But writing a response that seemed more a cathartic release rather than winning over public opinion didn’t serve the company’s long-term interests. Your commentary is fair but I’d go a step further and say if a brand/organization doesn’t want to be “accused” by the media, it probably shouldn’t be doing anything in the first place to draw that type of attention. I feel it almost always comes down to transparency. I’d say lack of transparency is what ends up killing so many brands (or at least ruffling their feathers). Be upfront, do good for humanity and the rest will follow. Is Kaspersky in bed with the Russians? Does Apple ensure that the workers within their supply chain have safe conditions? Is Google adhering to proper business practices in the EU? Lots of gray areas and points of views; hence, the punches.